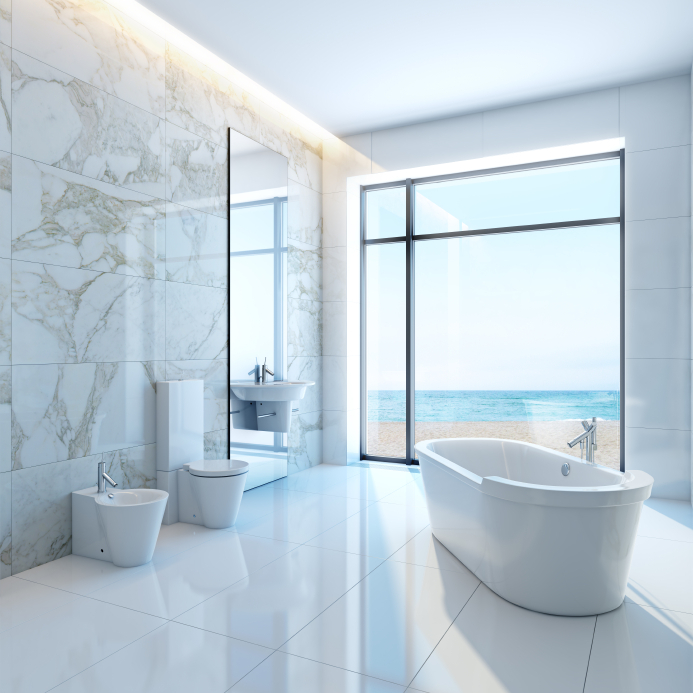 Bathtubs come in many different shapes and sizes, and most need some degree of tile to help protect the walls surrounding them from moisture damage. The tiles used to surround them can be as unique as the tubs themselves, with materials like glass making up both the wall behind the tub, but the also the tub face and deck itself. To help make a bathtub area appear larger than it is, consider using large format tiles on the walls, rather than on the floor. Large format tiles have fewer grout lines to break up the design, which can fool the eye into thinking the area is much larger than it really is. Tie the floor tiles in by using a similar color, but different size tile and pattern to complete the look. Another way to visually enlarge a space is to use the same color throughout. To avoid making the area look flat or plain, use natural stone tiles in a similar color to the tub itself. Natural stone has a natural variation and depth that varies from tile to tile that will lend some elegance to the design. If you are using a stone slab as your tub deck, consider using tiles made of the same stone as part of an accent band on the walls. This rainforest brown marble adds some color and movement to an otherwise plain stone tub surround, while the glass mosaics pick up the colors in the marble and amplify it. Put a slight update on a traditional tile design by using old fashioned tiles in new ways. Rather than offset subway tiles, try stacking them one directly on top of another for a clean, contemporary effect. Using a dark or bold color further modernizes the bath. If your tub is curved, consider tiling its face in mosaics, rather than building it into a larger, boxy deck. Mosaics are tiles that are 2-inches in size or smaller, and they will wrap around a curve, eliminating the need for a box built around the tub for it to sit in. Tie in the design by using the same mosaics as an accent wall behind. Using the same material on the tub face and the tub surround will create an unbroken visual line that helps to enlarge small bathrooms. This Carrara marble tub surround provides variation and visual interest while providing some camouflage for the tub. Use decorative tiles in a row to create a unique border. These Arts and Crafts style tiles break up an otherwise plain white tub surround, adding interest and detail. To further stylize the surround, turn the direction of the field tile from straight to diagonal after each row. Combine different materials into one, cohesive design. This tub surround uses green glass tiles on its deck, with tumbled stone tiles on the surround. A green glass chair rail provides an accent, framing the tiles while tying in the deck and adding some color to the walls. Use one type of material in a number of different ways in one tub surround to create a subtle, yet elegant design. Chiseled and honed stone tiles are paired with decorative stone tiles to create a uniform design that has lots of movement, variation and detail. To get some inspiration for the tub itself as well as the tile, check out these bathtub replacement ideas.